We recently had the opportunity to partner with University of Maryland College Park’s chapters of the Accounting and Business Association (ABA) and the National Association of Black Accountants (NABA) on a community service project. 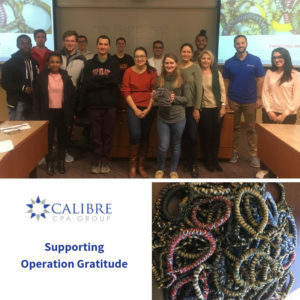 Our team, along with ABA and NABA, created nearly 100 paracord “survival” bracelets for Operation Gratitude. Operation Gratitude creates care packages for our nation’s soldiers and has delivered more than 2.1 million packages. The paracord bracelets can be used in a number of ways. These ways include securing camouflage nets to trees or vehicles, extending a security strap or rope to reach and haul heavy objects, creating a harness to extract an injured person from a bad location, or making a sling or splint.